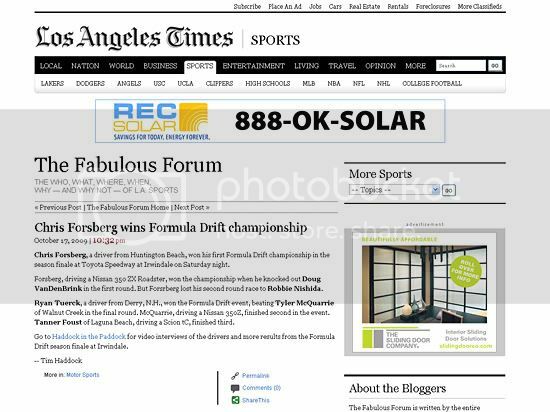 LA Times Video Coverage with Vaughn Gittin, Jr. The LA Times came by last weekend to cover the Round 1: Streets of Long Beach event and spent some time with Vaughn Gittin, Jr. Check out the story and video using the link below. Chris Forsberg, a driver from Huntington Beach, won his first Formula Drift championship in the season finale at Toyota Speedway at Irwindale on Saturday night. Forsberg, driving a Nissan 350 ZX Roadster, won the championship when he knocked out Doug VanDenBrink in the first round. But Forsrberg lost his second round race to Robbie Nishida. Ryan Tuerck, a driver from Derry, N.H., won the Formula Drift event, beating Tyler McQuarrie of Walnut Creek in the final round. McQuarrie, driving a Nissan 350Z, finished second in the event. Tanner Foust of Laguna Beach, driving a Scion tC, finished third. Go to Haddock in the Paddock for video interviews of the drivers and more results from the Formula Drift season finale at Irwindale.